Yeah, well. Thanks for that. Now: where’s the eye bleach? On Towel Day, no less! I didn’t know that Jar-Jar was 1) Jewish and questioning his faith and 2) worried about getting his period. Free and clear? Yes, to prepare for the vengeance all of us will now inflict on you. I’m glad you’re generally well-adjusted, John. Because if you saw to a shrink, you’d cause them to see a shrink, setting off a recursive cycle not unlike the shoe planet Douglas Adams wrote about. Bad John, bad John. Go sit in the corner. Oh, knock it off with the “eye-bleach” BS, people. Don’t act like this book didn’t resonate with you the first time you read it. When Jar-Jar was humiliated by his gym coach, Boss Nass, and Amidala and her little clique laughed at him at lunch? Are you kidding me!? I cried for two days. This one changed my life in the fifth grade. I’m not afraid to admit it. Thank you, Geoudy Blucas. And thank you, Scalzi, for the memory. Why does that sound like the Victorian phrase for an STD to me? You are sad, pathetic little man. Impressive. Most impressive. But you are not a Sith yet. Speaking of questionable uses of Judy Blume, Chuck Palanuik said at a talk I was at recently that his next book is kind of Judy Blume inspired. Maybe Judy Blume mashups are the next “…and zombies”. You’re a disturbed man, Scalzi. I knew I liked you for a reason. Me must, me must, me must increase mee-sa bust! @12 You’ve touched me, Jeff Hentosz. You really have touched my heart. This is a beautiful childhood memory. I am still bleaching my eyes, though. AAAAHHHHHH…. first my eyes now my ears are melting…. There *are* a few Jar-Jar-Binks-izers out there on the web. I bet some of the text from the book is out there, too. It’s a good thing I’m lazy. Did you wake up this morning to find that you were suddenly much taller than when you went to bed, were clothed all in black, and breathing through a mask? This book cover is an evil act on par with killing defenseless Jedi babies. So, when’s the book available on Amazon? Is this one of the secret projects? I live in George Lucas’s hometown, which he apparently snubs on a regular basis, so I approve of this highly. The only possible revenge is for us to imagine the rest of the book and then post it here, one or two sentences at a time. Picture having to read through all those comments…. Scalzi, I see you are having another episode. Perhaps you should take the pills now. Or not. This cause a diet coke lavage of my sinus cavities. And that kind of burn just wakes a girl up. Ah-hah. I thought it looked like the hand sanitizer was a little too close to the Coke Zero in yesterday’s photo. Need to be more careful about cross contamination there, chief. I must be one of the few sane people in the world because I don’t have a problem with Jar Jar Binks. And I’m a HUGE Star Wars fan. I should not stop by during lunch. Sometimes it’s fun, sometimes I have indigestion the rest of the day. Guess which kind of day I’m having now? Hey, it’s not completely a non-sequitur. He mentioned Judy Blume! See you this weekend, maybe, depending on John’s mood and my sinuses. After seeing that I will be forwarding to you any and all bills for the required therapy. Please pay them at your earliest convenience. You are a sick, sick person, Mr. Scalzi. Okay – I keep coming back to it. I believe this will probably continue to provide a titillating blend of nausea and amusement for the rest of my week. I may get fired. It might be worth it. On a side note … Karen, thanks for the links to the Garrison article. All the haters. I wanna know when the big idea for this is coming out? No, no, no. The only suitable revenge (oh, wait, Jedi don’t do revenge!) is to ask John when he’s going to be done with this manuscript at every single public event from here forward. I have a theory that the same aliens that abducted Michael Jackson also made off with George Lucas. It’s the only possible explanation as to how a man could go from expelling pure magic with every breath to butchering my beloved childhood memories. Are you there, God? 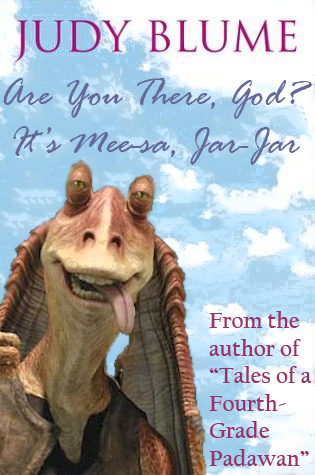 It’s mee-sa, Jar-Jar. We’sa movin’ todays. Mee-sa so scared, God. I’sa never live anywheres but this-sa planet. Suppose I’sa hate da new skies? Suppose all they’s creatures there wantsa eat me all up? Please’a help me God. Don’tsa let Tatooine be so horrible. Thanksa. Five Quatloos if someone has that image on T-shirts at Phoenix Comicon. Ten, if you get a picture standing next to John. Fifty, if you get him to sign the shirt. I can easily forgive the creation of the ridiculous Jar-Jar, because, 1) Han Solo is too cool for words, 2) he wrote the story for the film, Willow, and 3) the best TV show ever, The Adventures of Young Indiana Jones, makes George Lucas dang awesome in my book.